Remotes are pretty important in a clay studio. They keep you from actually pushing any buttons on the stereo and causing a premature death of the stereo (I speak from experience on this, several times over). 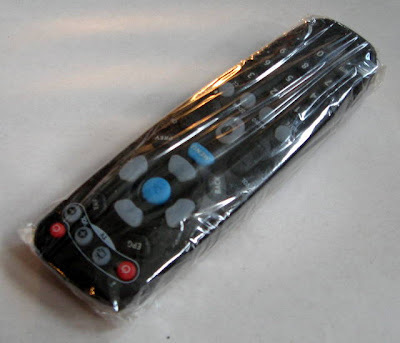 But the remotes can get crusty too, so you have to protect them. 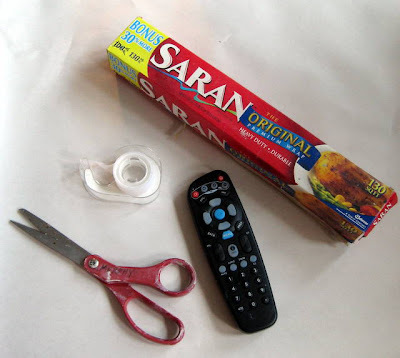 You need plastic wrap (although I don’t actually suggest the kind pictured below, it’s just what I had in my studio), scissors, tape and of course, your remote. 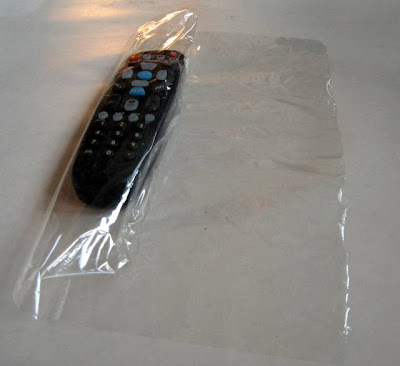 You can use plastic wrap, dry cleaner plastic, a clear plastic bag. It will tear eventually, so 2 layers of plastic is suggested. Generously tape up the folded ends on the back of the remote (I hope that’s obvious!). And voila! You’ve got a fully protected remote! The sensor part works perfectly through 2-3 layers of plastic. If you use a thinner plastic wrap than I did it will be a pretty tight fit. This is a problem that comes up all the time- two different clays that need to become one. Maybe you have some clay that’s too hard and some clay that’s too squishy. Or you have some stoneware and some porcelain (a great mix in the soda kiln!). It’s really hard to just wedge them together, and it’s a lot of trouble to put it through the pugger- especially if it’s just a small batch. 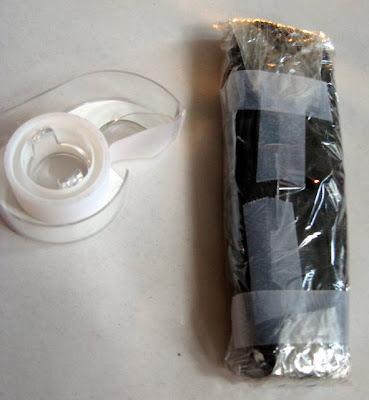 This will save your wrists from some stress and get out any aggravation that you might have at the same time. Slam down onto your table (or wedging board) one type of clay on top of the other. Then slice it in half through the middle. And slice and stack (slam!). Watch the clay mix together! It’s very satisfying to see the two different color clays mix like this. Keep mixing until the slices of clay are really small (even smaller than this). Once it’s mixed through the slice and slam process, then wedge. It’s much easier to slam the clay down then wedge the big hunk that well. This method is really great for clay that’s too hard and too soft. It’s nearly impossible to wedge those two consistencies together. And as I mentioned above, a porcelain-stoneware mix is great for the soda kiln (or any other atmospheric firing). 50-50 is my favorite mix. Through a little extra sand in for extra orange peel. Maybe this how-to will make your wrists a little happier.